A big brother to the 5.5-inch A3, UMIDIGI's A3 Pro touts a phablet-esque 5.7-inch In-Cell facade with a wide 19:9 aspect ratio and a 90 percent screen-to-body ratio. 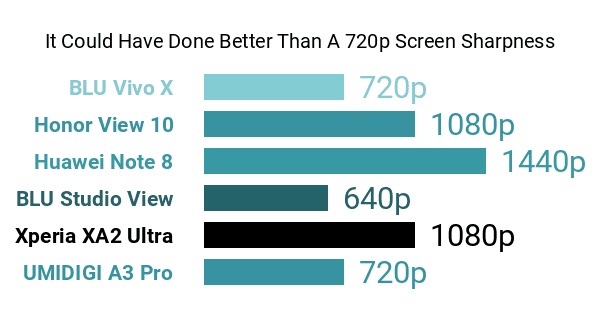 That being said, it won't be joining Phonerated's list of the best phablets any time soon, seeing that it suffers from a low-end 1512 x 720 screen definition and, consequently, scores an underwhelming 293ppi pixel density count -- many truly-high-end large-screen phones tout 1080p displays. Adding to the A3 Pro's weak points is the fact that it opts out of the octa-core race, instead sticking to an old-fashioned quad-core 1.5GHz MediaTek MT6739 processor , although it does bump the A3's paltry 2GB RAM count up to 3GB. Also, it comes with 32GB of native memory this time (A 16GB-only version is also offered), with support for up to 256GB of top-up memory at the ready. Joining the aforementioned pros and cons in the engine room is a 3300mAh battery that we consider hearty enough, considering the relatively undemanding quad-core processor that it has to support. 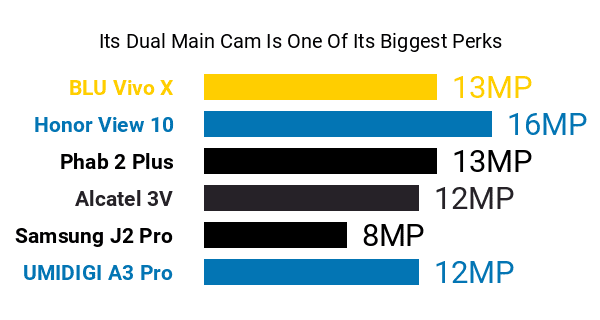 Additionally, some comparable budget-tier phones that came out around the time of this specs-based review do not even reach the 3000mAh threshold. Another rather unsung pro is the A3 Pro's double-sided 2.5D curved glass finish , which gives it a slight edge versus plenty of other low- and mid-range phones physique-wise. Moreover, from a budget-class standpoint, it's easy to appreciate its 12- plus 5-megapixel 6P-lens dual rear camera , especially since it brings to mind the cameras offered by some higher-specked photography-driven models. Sadly, its 8-megapixel f/2.0 front cam sounds like a slight con, if only for its mundane raw pixel resolution, although it does carry the phone's Face Unlock feature, which works hand-in-hand with its rear-mounted fingerprint sensor on the security front. So, given its assortment of pros and cons, the UMIDIGI A3 Pro sounds like a feasible choice for those in search of a wide-screen, dual-camera-rigged mid-range Android.